This week Nilla Berglie brings us the week's challenge for There's Magic in the Air. She would like to see us use the "Lucky Bear" image (free at TMITA) and any technique you would consider a method to distress! Since I was distressed that I could not make a papercrafted card ...does that make my project distressed enough? LOL Since I cannot actually distress something phsyically, I figured out a way to make a digi card look distressed. My project may not meet the requirements but I am going to submit it anyway and let the team at TMITA decide. 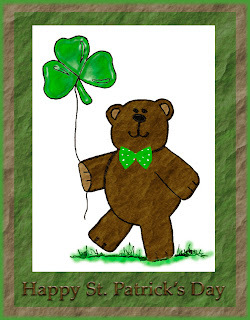 I just love this "Lucky Bear". My distressed element is "background mats" of brown and green that I made to look like "old paper" that I "wrinkled up". Not really but "paper" looks like it. Selma Stevenson brings us this week's TMITA challenge. She wants you to use any Paper Cupcake's image you have acquired or downloaded and also wants to see you use lace (either paper punched or real) and a circle (the main image and/or greeting stamped in a circle). 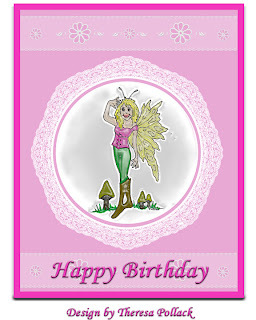 I used the fairy image that could be downloaded this week. I used Photoshop to create my card using a digital lace circle and border. I colored the digital image with Photoshop and also used a special effect to give the image a "plastic" look for texture. Thanks to TMITA for allowing me to do a digital card since I cannot use my right wrist. Thanks to Selma for a great challenge. I found this stary night background in Photoshop Elements and thought it would make a great card. Also designed the inside of the card. 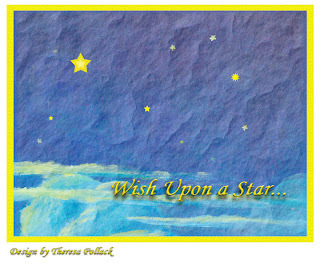 Used "yellow" as "base card", added graphic, added some more stars, and typed in sentiment. Used one of the special features to add texture ( old paper). Love how you can match colors by using eyedropper to select exact color from the background or features. 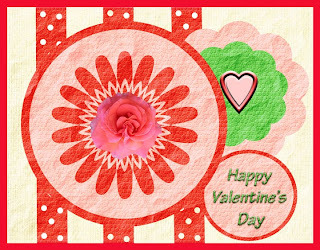 Wishing all my stamping and crafty friends much love today! 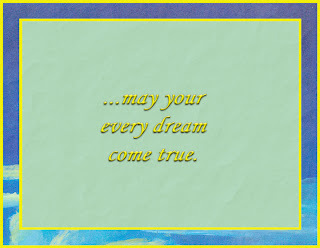 May you share this special day with those you love and be warmed by that love if you are in a cold and snowy climate! 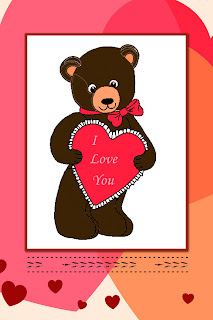 I created this card using Photoshop elements. 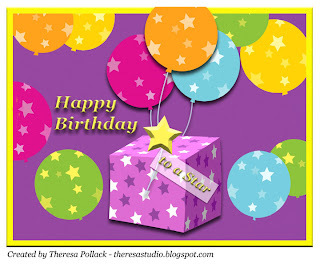 Made my "base" card a bright yellow and added in balloons with stars on purple "mat" (a background option in which I changed color to purple) and a gift box (graphic option) with stars. Added more balloons (graphics) and a star (shape option). Typed in sentiment and a tag for gift. Did some layers with special effects to add dimension. Word of advice: Save your project as you are creating. I did not save as I was making my card.....program shut down...and I lost the card just as I finished and had to recreate. Anyone having a birthday today? Made this card only using Photoshop Elements. Used some of the PS effects to add texture to the "paper" and "shapes". Rose is a graphic from PS too. Experimented with a lot of colors, effects and text before deciding on the final card. DH had a look and helped decide on final effects. And I did not use any punches or nesties for the circles or scallops.Great thing is that you can try out lot of things and not waste paper or ink. Love how that heart looks like a metal brad!! 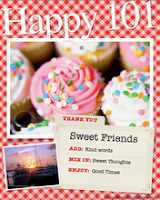 I used STV freebie digital paper from 100% Sweet Paper Pack to create this card with Photoshop. 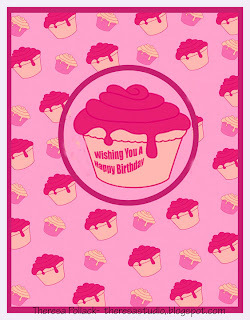 Used a cropped out cupcake to feature since I am unable to stamp and then typed sentiment for my card. Making this post short and sweet. 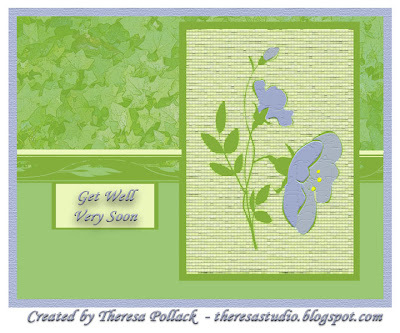 has a great challenge by Patti J using their free digi this week with flourishes and/or pearls to make a comforting card. My result using Photoshop to make a card is shown. Colored the bird using PS and typed a sentiment. Found a digi flourish online but forgot to note the source. Flipped it to make the bottom border. Copied a pearl from photo online and made my "pearl bling". Added a lavendar "mat" to back of card and "mat" under bird using paint can to fill in. This was another digital card using only Photoshop to create. Yes I can print this card but do not have printer here in Florida. I have even printed cards and added texture and bling after printing. 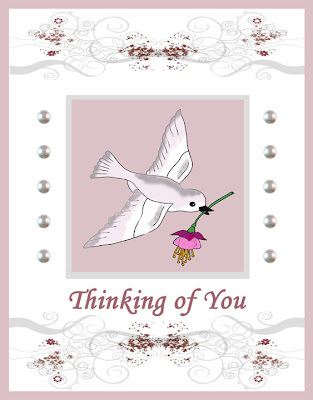 For example, I would print this without adding those digital pearls and then add stick on pearls to the card. I used to make all my cards totally on the computer using Print Shop and Photoshop but made mostly photo cards or cards using printed images. That was before I got into stamping, embossing, etc. I like the more handmade look that these techniques add. Hope you enjoy my digital interpretation of this challenge. Thanks for dropping by. Hope you have had a great day! 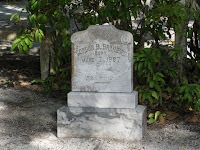 Al and I visited the Captiva Cemetery and Chapel by the Sea on Saturday afternoon. 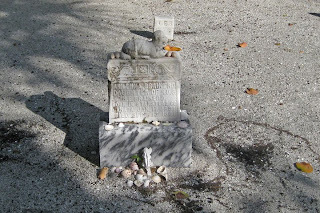 Located adjacent to the Captiva Chapel by the Sea, the cemetery is on a portion of land originally homesteaded by William Binder and bought from him in 1900 by Ann Emma Brainard (daughter of Hattie E. and Herbert D. Brainard) because this was her favorite spot to watch the sunsets. She died the following year of tetanus and was buried on her small parcel of land along the Gulf of Mexico. Her parents later bought the land surrounding her grave and donated it to the islanders as a cemetery. Her grave is shown above. The Chapel of the Sea located near the cemetery was built in 1903 and was originally Captiva's first schoolhouse built on land donated by William Herbert Binder. It also served as the community church when the circuit preacher was on the island. In 1917, the school ceased to be a school and in 1921 it became a Methodist Church. A group of Captiva residents purchased the property back in 1948 and changed it to an interdenominatonal church called the Chapel by the Sea. Services are held from November through April. Thanks for stopping by. Hope you enjoyed the bit of history. The most colorful birds in DDWR are the Roseate Spoonbills but they have such ugly faces with their beaks shaped like spoons. These pictures show them resting with their heads tucked under their wings. They are most beautiful in flight when you can see the beautiful colors in their wing feathers. Hope we will shoot a better picture to show them in full color. Click on pictures to see larger view. 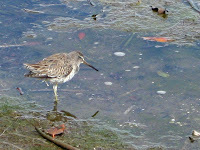 Pictures by DH at Ding Darling Wildlife Reserve on Sanibel Island, one of our favorite places to spend time. 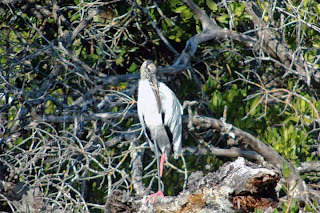 Woodstork posing at DDWR. One of the ugliest birds but so beautiful in flight. Jeannie's sketch challenge on StampTV is shown on the right. I attempted to do another card using Photoshop and came up with this. I used digital paper from STV's freebies Sweet Paper Pack using 2 patterns. 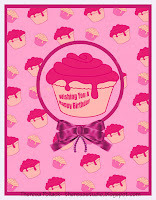 I used a pink base for card, created a "mat"of the green pattern and created "squares"of the cupcake pattern. Added some hearts and ovals from graphics in Photoshop which I colored to match DP. Typed in Sentiment. Voila!! My card is in lower right! Used the colors in the Digital paper as my inspiration. Am not posting on STV since I really did not do stamping but was fun to see if I could do this challenge. Thanks for stopping by. Would love to hear your comments. Sending this from sunny Florida. I hear from our neighbor that we are missing a 15" snowfall at home. I really wanted to do a challenge with the image from There's Magic in the Air ...such a cute bear! Sue Walsh, a cyber friend of mine, brought us their challenge this week. She wants us to use this image from Paper Cupcakes " I Heart You" and she would like to see the image used on a Valentine gift tag with some stitching somewhere on it. (Stitching can be done with thread or also can be hand drawn). 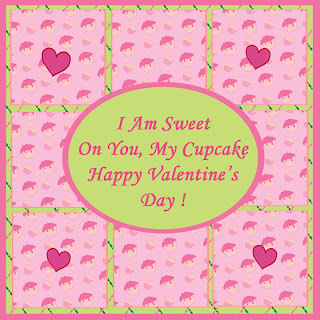 Well, I downloaded the image and colored it in Photoshop Elements....added the background and typed in a sentiment on the heart, added a frame, and even found a border that looks like stitches. That "stitching" is for you Sue! The result for my tag is seen to the right. Not the same without layers and dimensions but is best I could do with a broken wrist miles from my studio. Kind of feels like I cheated but feels good to create this. Please check out the challenge and all the great projects made with this image. 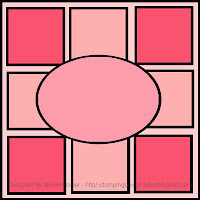 My friend Linda is the guest designer this month and many of my stamping friends are on the TMITA Design Team. 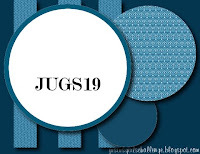 I received this blogger award from my stamping friends Patti at Stampersize and Mary Anne at Lakeside Stamping some days ago but am just now posting. Thanks to them both for thinking of me. They are both so creative and supportive. Please check out their great blogs. This award requires that I list 10 things about myself and I pass the award onto 10 fellow bloggers. Here goes.. ..
1. I am 5' 2", eyes are blue...sounds like a song. 2. I was the 3rd of 4 siblings...2 older brothers and 1 younger sister. 3. I grew up in a small town in West Tennessee. 4. I graduated from the University of Tennessee in Knoxville. 5. My hair is really gray and straight but I keep it brunette and permed. 6. I never have had a broken bone until I broke my wrist on Jan 13, 2010. 7. I have always wanted to play the piano...but have no musical talent....the doctor said I should be able to play the piano when my cast comes off....that's a joke! 8. I will be 65 on June 18th this year....sounds so old when I see it in black and white!!!! Ugh!!! 9. I love all my online friends and love to read their comments. 10. I love all the time I spend with my DH laughing, traveling, birding, and eating good food. I am not going to pass this award on to 10 bloggers since most of my blogger friends have already received and it will take me sooo long to type any names and links. I have already spent a long time getting this much posted. LOL! Hello from Captiva, FL. Arrived here on Saturday after driving since Thurs. When we left from OH early Thurs, it was snowing lightly. We stopped for the night at my brother's in Norris, TN. We left there on Fri am before the snow arrived.....they had 4-6" snow across the state of TN but we were driving ahead of it. Stayed Fri night in Ocala, FL and arrived to 70 degree temps in Captiva. A far change from the temps in OH. My DH drove most of the way but I did some driving to relieve him. Thanks to all who have sent wishes for a speedy recovery. Doctor says my broken wrist is healing nicely....changed my cast before we left for our trip...went from party pink (for Mom's party) to tropical blue for the beach!! LOL! I am able to walk without as much pain as my right knee is healing too. Guess if I cannot do much of anything but rest, sunny Florida is the place to be. It takes so long for me to type, I cannot even do much of that. But I will try to post about our stay here. My Mother's 90th birthday on Jan 17th was a huge success.....over 110 of her relatives and friends attended including all her grandchildren and great grandchildren. She was on "cloud 9" and had a grand time. 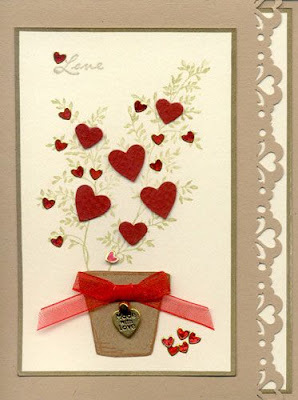 I really miss stamping and making cards but will be following your cards and challenges from FL. At least I can think about ones that I would have made.....When this cast comes off, I'll be making tons of cards ....letting all my stored up creativity flow!! Patti, thanks for the surprise...will post later. Be back soon with pictures of this beautiful island.